How to take my dog to the pet sitter’s home? WHAT OPTIONS DO I HAVE TO TRANSPORT MY DOG TO THE HOST'S HOME? How to take of your dog over the holiday season? How to take your dog to the petsitters home? We use the car to travel around, but not always easy when it comes down to transporting your pet. The way you travel and the distance is important to take into consideration before, especially if your pet is car sick. There are different options to take your dog along, it all depends on the distance, on the breed and your dog’s habits. Depending on your dog’s size, you may opt for the train. You’ll be able to look after your pet without worrying about the road traffic. This way, all along the trip you’ll be able to reassure your pet if he gets stressed out. Dogs are used to going out with their owner’s in the car, this option is the most common way of transport. Please be wary before considering it. You’ll probably need a travel cage so that your dog doesn’t disturb the driver. However, this situation may stress your pet, so it would be better to put it on the back seat so you can keep him within eye contact distance, to reassure and talk to him. There are companies that are specialized in transporting animals, they are called ‘pet taxis’. These taxis are used to taking care of dogs during the holidays. They have all the knowledge needed for a stress-free journey and are there to listen to your dog’s needs. Are the better times in the day than others to travel with your dog? First of all, the dog’s behavior will vary depending on the time of the day: day or night. If you travel during the daylight, your pet will be able to admire the countryside and be more alert. However, please be careful, by watching the road go by, it may make your pet feel ill at ease, he may fidget a bit more, move around; which could be dangerous for the driver and the animal. The fact that his eyes are following the road but not his body sends opposite information to the brain, making your pet feel faint or even road sick. Travelling by night has many advantages. Dogs are calmer in the evening and may even fall asleep during the journey. His brain takes in less movement information which highly reduces car sickness. However, it may be riskier for the driver to travel at night time. Whether you decide to travel during the day or night, the journey you choose must be the most adapted for your pet so that the situation stays comfortable for everyone and the less traumatizing possible. To conclude, the length of the trip is important to anticipate. Make sure that it will not be too long time wise as it could become a very stressful moment for your pet. How to react when transporting your pet? It can be a stressful moment transporting your pet, you should take into consideration a few points before hand. First of all, do not forget to take along your pet’s bowl with some water. During the journey your pet may get dehydrated rather rapidly which is dangerous for his health. If your pet starts to pant, it’s time to get the water bowl out. You need to keep a permanent contact with the animal, either eye contact or an occasional stroke so that he knows you are there. Otherwise, he may panic or try to jump onto your lap which could lead to a dangerous situation. It is better not to travel alone with your pet. Always easier to have a smooth journey if there are 2 or more people. If something happens, if your pet is sick, starts barking and gets agitated, always better to have someone with you. Don’t forget to have frequent breaks along the journey. 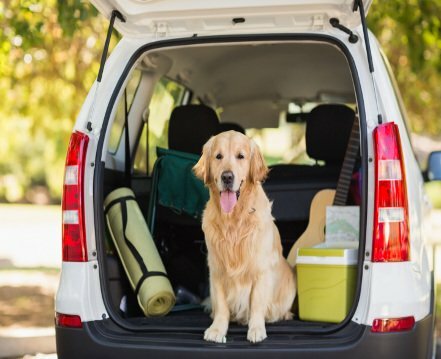 For most dogs, the car trip is not an easy task so by stopping off from time to time, it will give your pet the time to stretch his legs and the trip will become more an adventure and game rather than a hard ordeal.